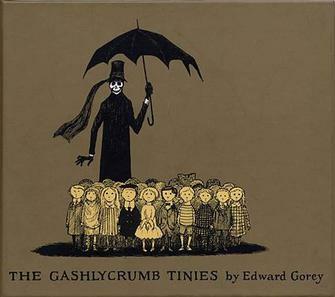 Cover to the Gashlycrumb Tinies by Edward Gorey. A darkly sardonic rhyming alphabet book, each letter itself a tiny tale of terror:’A is for Amy who fell down the stairs,B is for Basil assaulted by bears.’Go to Brainpickings to find out what happened to poor old Maude and Neville! In our last unit one of the questions we asked was: Why do some people stand by during times of injustice while others take action? In the course of our reading, the words compliance, resistance, dictatorship, discrimination, opportunism and certainty became concepts invoking terror. The creation of the next in our series of Tiny Tales is the culmination of 20- 30 minute inquiries conducted at the beginning of class once or twice a week over several weeks. Students in small groups researched words asking the foundational questions of word inquiry:what does the word mean? how is it structured? and what other words are related? Once we had gathered our morphological and etymological information, we reworked our initial definitions. We discussed each word in depth- asking tough questions: what causes discrimination? Who is complicit in this? Why do so may stand by and comply? What causes compliance? What are the circumstances that cause some to resist? Are there shared traits of those who resist ? 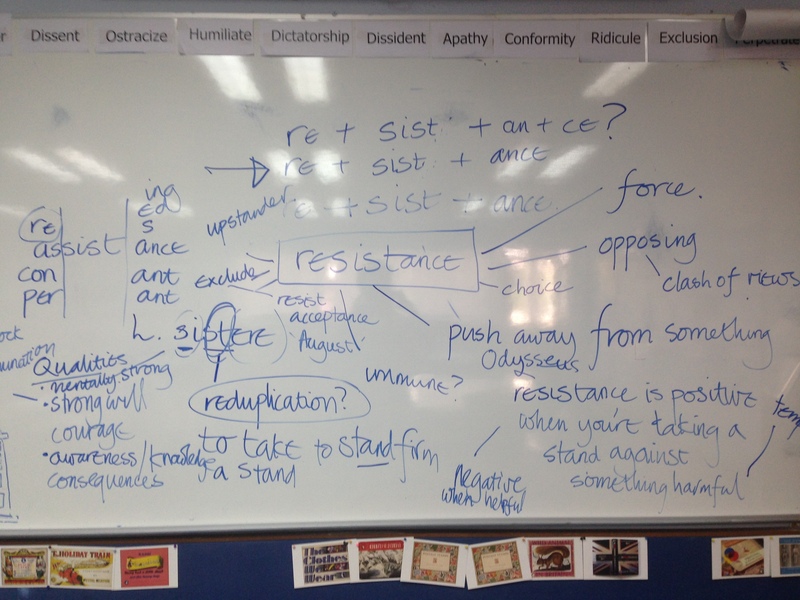 Quick notes capturing some elements of our class discussion around the morphology, etymology and meaning of the word <resistance>. Once we felt we understood these words, had argued and thought and asked each other many questions, we used our understandings of the words to illuminate our Tiny Tales. We came to see that these words were, in the context of our study, terrifying. 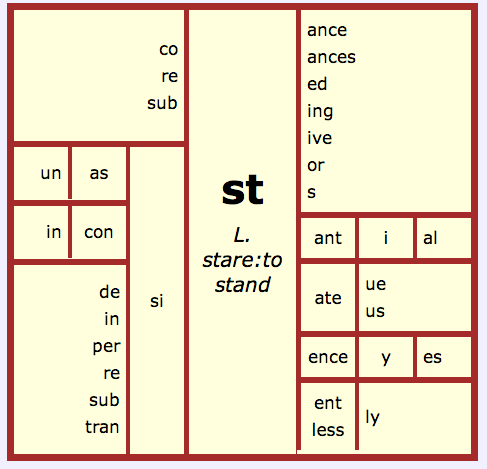 The words that have informed this matrix above are a mere drop in the <st> ocean of words. As the number of words with <st> as a bound base become increasingly apparent to us, we envisage the matrix as becoming enormous and perhaps unwieldy. We are currently discussing the advantages and disadvantages of treating <-si-> as an analyzable element and separated in the matrix. Is the matrix and the ability to form words from this more manageable if <sist> is treated as a bound base element? After all, <si> is not a base element, nor a prefix. Does <si> occur as a reduplicated form with other bases? How could we acknowledge the <st> base embedded within <sist> ? All questions form part of an ongoing discussion. See our earlier work and discussion of this word resistance here. Hidden behind the production of Tiny Tales is rich dialogue as we grapple with a word’s meaning, cite examples and see how its connotations can change from positive to negative depending on the context. We enjoyed the collaborative nature of producing the work from the research to everyone choosing someone else’s writing to illustrate or to bring to life through voice. I cannot close this post without mentioning ‘certainty’. The word certainty <cert+ain+ty> from the Latin certus, cernere to sift, to separate, was the basis for lengthy dialogue and sparked by an inspiring article in the New York Times brought to my attention by my colleague Erik Ortman ( you’ll often see him working with students in class videos). In our discussion we could see the dangers of certainty, the stultification implied by the ‘right’ solution, correctness. We saw its antithesis as doubt. ‘Doubt sometimes comes across as feeble and meek, apologetic and obstructionist. On occasion it is. But it’s also a powerful defensive instrument. Doubt can be a bulwark. We should inscribe that in marble someplace.’ Cullen Murphy, The Certainty of Doubt, New York Times (2012). Watch Bronowski’s eloquent and moving warning about the dangers of certainty . This is the final clip in episode 11: Knowledge or Certainty from Bronowski’s “Ascent of Man” series. We realized, as we reflected on our study, that our choices impact others, that we need courage to act with integrity and to stand up to — and for — others. Above all, we must question.